← Unemployed in Acocks Green? 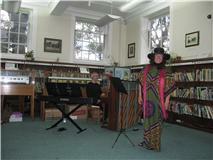 This is a review of a recent musical event that took place at Acocks Green Library on 21st July – Swansong. Thanks to David Treadwell for his review. If you would like to attend the next musical evening (22nd September) contact the library directly. The programme was a selection of romantic songs and music from around Europe and Russia, admirably performed by both artists. Stella Seaton-Sims has a broad repertoire of sacred and secular music but her keen interest is in Russian music, which has taken her several times to Moscow, where she researched and studied with Prof Galina Pisarenko of the Moscow Conservatoire, one of the trips having been sponsored by West Midland Arts. Phillip Ypres-Smith studied at Birmingham Conservatoire and subsequently joined the staff as a répétiteur and vocal coach before working as a freelance musician. We had another local connection in that Mr Harry Seabourne who was present, assisted with some of the Russian Translation. The Next Swansong Concert to look forward to is on Wednesday 22nd September at 7.30pm, when we have a visit from The Queens Park Sinfonia, who will be performing music by Mendelssohn and Strauss. This entry was posted in Events and tagged Acocks Green, library, mezzo-soprano, Mr Harry Seabourne, Musical Concert, Phillip Ypres-Smith, piano solos, Queens Park Sinfonia, Stella Seaton-Sims, Swansong. Bookmark the permalink.